Get your pet microchipped for $15 (includes registration) or for only $10 (includes registration) with spay/neuter surgery at our Low-Cost Clinics. Have you planned for you AND your pet in case you must evacuate? 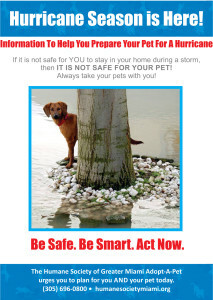 June 1st through November 30th is hurricane season and the Humane Society of Greater Miami urges you to prepare now in the event that you will have to evacuate your home because of a storm. It is important for you to plan now to avoid last minute surprise and confusion when a storm is approaching. 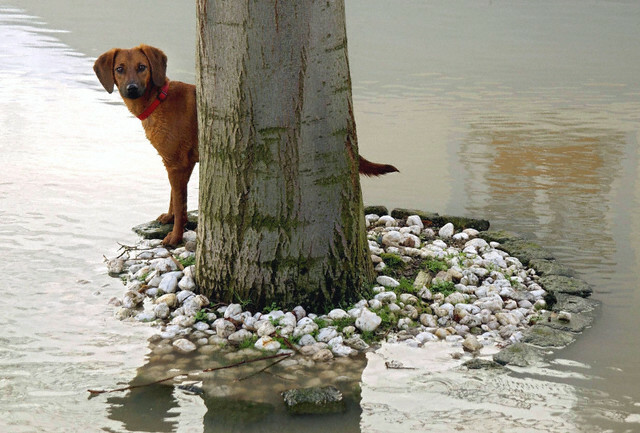 It is possible to evacuate with your pet if you plan ahead! The Humane Society offers a free hurricane guide containing disaster preparedness tips and information about the two pet-friendly evacuation shelters for people offered by Miami-Dade County. You can view and print the guide by clicking on the link below (get a free copy of Acrobat Reader here if needed). For a list of pet-friendly hotels and boarding kennels in Greater Miami, Broward, Palm Beach, Naples and other surrounding areas that may accept your pet in the event of a hurricane, go to www.officialpethotels.com. Did you know… Miami-Dade County has established two pet-friendly hurricane shelters for people (one in Southern Miami-Dade, one in Northeastern Miami-Dade). You MUST register in advance (when a storm is approaching, registrations will cease). Please call 786-331-5354 for a registration packet. Please bring donated items to one of our adoption centers. Pick up may be possible for bulk donations (please call 305-749-1833).